"This Tragic Earth" is the latest in a cavernous series of books by Inner Earth researcher and Fortean, Michael Mott. It is also the latest Shaver Mystery book to emerge since Tim Swartz's "Richard Shaver: The Reality of the Inner Earth" was published in 2005. Coincidently, both books feature Lost Shaver Manuscripts ... (OK, are there coincidences, or are there just telaug manipulations of the time/space continuum?) In any case, this is good news for Shaverites! It means there are fewer lost Shaver manuscripts languishing in cardboard boxes throughout the world. My question is...how many more of these Lost Shaver Manuscripts are out there? An inquiring mind (Mine--Figbar Tobar's) wants to know. 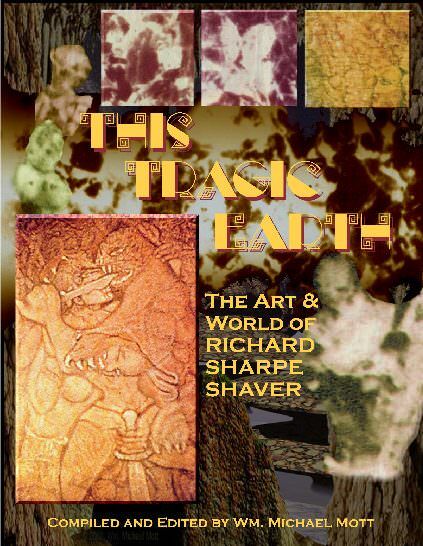 What makes "This Tragic Earth" different from other Shaver books is it's detailed focus on Rogfogo. Mr. Mott has painstakingly Photoshopped scores of Shaver rock fogo, carving out images so viewers can finally "see" what Shaver saw. And sometimes, that is no easy task, believe me! Not to be overlooked is Mott's introduction, where he inadvertantly inflates the Shavertron editor's fragile ego. In fact, several Shavertron articles are reproduced within the pages of "This Tragic Earth," along with articles from defunct, vintage 'zines like Mystic, Search, Vampire and more. As is pointed out on the back cover, "This Tragic Earth" also features "...a facsimile of an actual hand-made book proposed by Shaver, sent to Ray Palmer." Featured also are long-lost aritcles on how to find and create your own rock books. Learn from Shaver himself.